These ruggedized tablets, available in 7” and 10” models, are made for POS and make long term durability a reality. The Quest II offer ultra-low power consumption and extended battery life when in continuous operation. Weighing in at less than 1.5 lbs. for the 7” and less than 2.1 lbs. 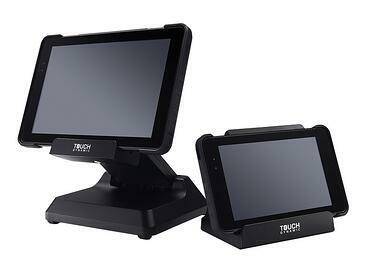 for the 10”, the Quest II is ideal for line busting, table side service and all your mobile POS needs. Rounding out the restaurant experience are it’s multiple purpose docks that can take the tablet from mobile to a workstation in seconds. These docks can be locked to ensure the it is not removed when it’s not mobile. It can also be mounted to the wall with a separate bracket. Quest also makes a 5 bay charger that offers the option of charging up to 5 batteries simultaneously ensuring that your staff always have fully charged batteries to the meet the most demanding days in the busiest of environments. Quest also has holsters for both models as well as a swivel hand strap with around the neck capabilities. Finally, you can pair it with Epson Mobilink P20 ultra compact receipt printer and deliver a complete mobile solution, anywhere in your restaurant.